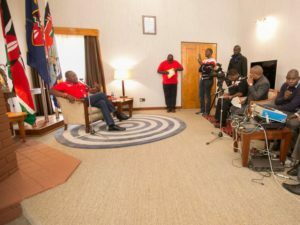 President Uhuru Kenyatta during an interview at Kakamega State Lodge today. Courtesy photo. 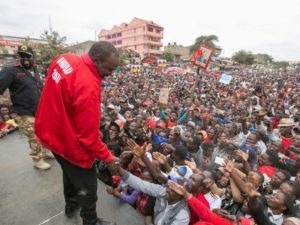 Kenya: President Uhuru Kenyatta on Friday took his charm offensive to Western where he defended Jubilee’s development agenda. He dismissed claims that his administration has segregated counties there since they are Opposition strongholds. Speaking at Kakamega state lodge Uhuru said the region is among areas his administration has put more focus on in terms of development. He noted the government injected Sh500 million in a bailout to ailing Mumias Sugar Company so it can settle unpaid farmers’ debts. The President said another Sh300 million was paid to Nzoia Sugar to cater for debtors including cane producers. Uhuru, in his 12th visit to the region since the last election, noted his government also revived the collapsed Rai Paper (previously Pan Paper Mills). He said the venture has seen the employment of 800 locals, adding that the number will swell once all the production lines are operational. Rai Paper commissioned its second line on Wednesday –bringing the number of people to be employed to 1000. “My government has also constructed various key roads in Kakamega, Busia, Vihiga and Bungoma counties, ” Uhuru added. The head of state further said the Jubilee administration has initiated construction of more roads in Western Kenya than any other government. While promising to settle all Internally Displaced Persons in the region, Uhuru urged residents to vote for him for a second term. He said this will allow them to finish the ongoing infrastructural developments which he said will ease the current high cost of living affecting Kenyans. “We will not succeed unless we complete ongoing infrastructure projects – roads, electricity among others. This is the surest way to reduce costs,” he said. He appealed to village elders to identify the genuine IDPs so that the matter is settled once and for all.